A tech website recently asked a bunch of tech writers, including me, to name our favorite productivity software. Most people named things like Evernote, Google Docs and Slack. It’s the Mac calendar app, just released in version 3, that knits together the many strands of my life: appointments, trips, meetings, calls, reminders, wife, children, schools, employers, vacations, deadlines. Without a program like this, my life would fall apart like wet Kleenex. 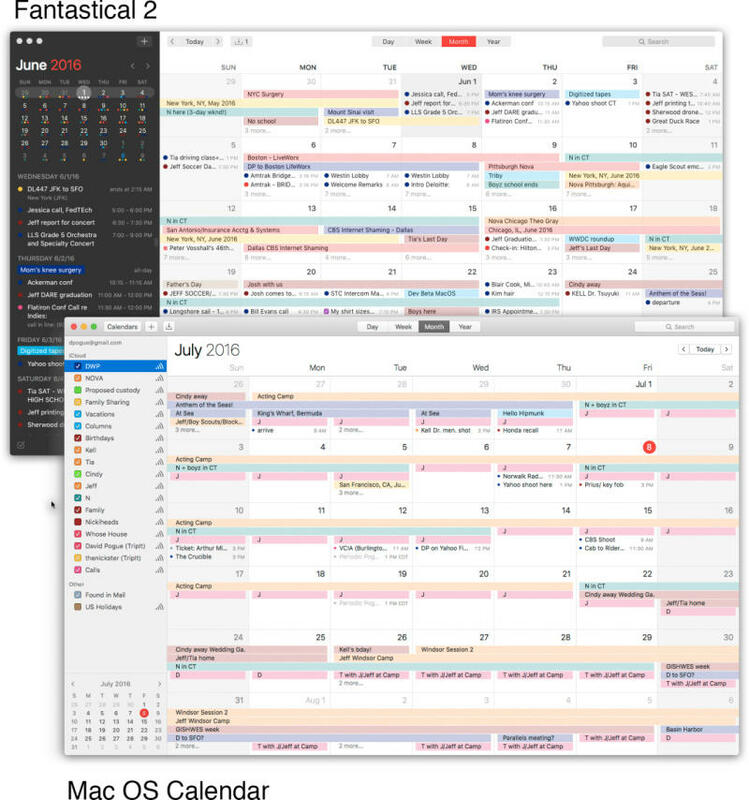 Of course, both Mac and Windows come with basic calendar programs, free and built in. And most people who work regular days and regular hours may not need the flexibility, power and beauty of a more turbocharged calendar app. But until you’ve tried one, you don’t know what you’re missing. Neither BusyCal nor Fantastical imposes its own file format; they act as gorgeous, customizable lenses on the calendar data you already have, like Google Calendar, Microsoft Exchange or Apple’s iCloud Calendar. You’re free to hop back and forth between BusyCal, Fantastical and the basic Apple Calendar app; it’s all referencing the same underlying calendar data. What you’re about to read, therefore, has two purposes. First, it’s to show you what you might gain with a more powerful calendar; second, it’s to characterize the two contenders. 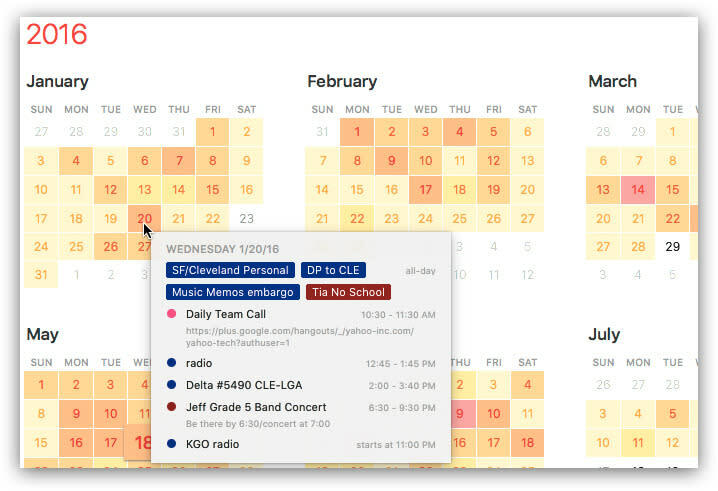 All three programs show a “heat map” in Year view, which lets you spot your busiest times. (BusyCal shows individual blocks representing the appointments.) You can point without clicking to see what they are — something else that the basic Calendar app doesn’t do. BusyCal 3 finally joins Fantastical and Apple’s own Calendar with the most brilliant calendar-app feature since the pop-up alarm: infinite scrolling. Why on earth should a computer calendar always display the first week of the month at the top of the screen? Why should you have to click Next or Previews to scroll in one-month chunks? That’s a holdover from the paper days, and it’s totally unnecessary now. Infinite scrolling gives you context. It shows you where you are in your life, and lets you effortlessly peer ahead in your timeline. All three programs let you create various calendar categories for your appointments — Work, Personal, Kids, Social and so on. But BusyCal and Fantastical let you put these categories into groups, whose appointments you can hide and show with a click. I keep my three kids’ schedules in a group called Kids; when I’m studying my own life map, I can hide all of their appointments with one click on the group name. Like Apple’s calendar, BusyCal keeps these categories visible in a panel at the left side of the screen, which you can adjust or hide. Fantastical’s makers assume that you won’t actually turn these categories on or off very often; to change sets of appointments, you have to use a keystroke or dig through a menu. All three programs let you enter appointments by typing plain-English phrases into a Quick Entry box — things like “tomorrow noon lunch with Casey” or “Nov 13 movie premiere 8-10pm,” for example. The program automatically parses what you’ve typed and adds it to the correct date and time. Once you learn the ropes of BusyCal and Fantastical, you can even specify appointment durations, advance alarms, and calendar categories this way. For example, “nov 13 fishing trip 2pm 3 hours alarm 45 /s” means that that appointment will last for 3 hours; you’ll get an alarm 45 minutes before it starts; and this appointment goes into your Social category (or whatever starts with S). Super nice. In Busy/Fantastical, you can just double-click a Month-view square and type “2pm salary meeting” or whatever. That is, you never have to fiddle with the little Start Time and Stop Time controls, as you must in Apple’s program. All three programs offer a Location box for each appointment; start typing an address or business name, and the program fills in the actual address for you. Very nice. 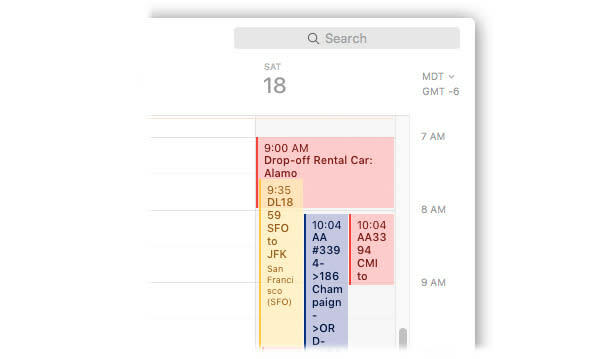 Only BusyCal (and Apple’s basic Calendar) can compute the travel time to an appointment and block out the corresponding time on your calendar. BusyCal, in fact, even attempts to figure out where you are beforehand — at work (during workday hours), for example, or at a previous appointment, if you’ve added a location to it. 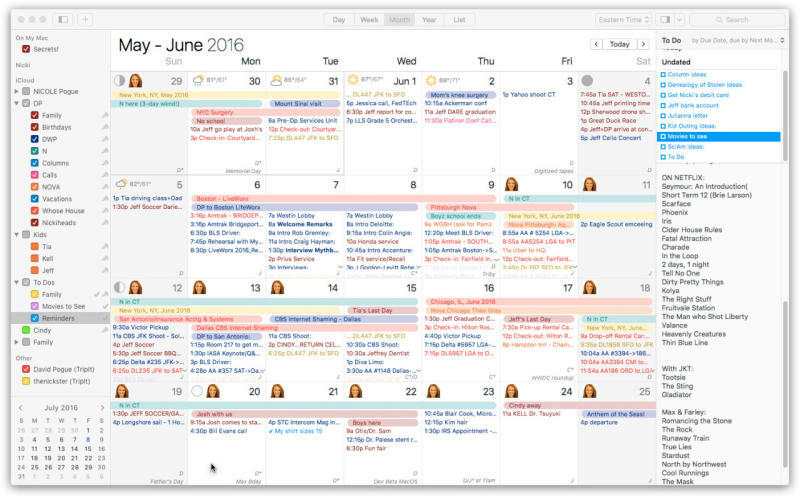 BusyCal also lets you paste little graphics into your calendar — a feature I actually use a lot. It lets me see at a glance when my wife and I are both at home (we both travel a lot), for example. You can hide or show your To Do list in all three programs. In Fantastical, it appears in the left-side panel; in BusyCal, it’s on the right. Busy/Fantastical can also show these tasks right on the actual calendar squares, which makes a lot more sense than confining them to a side panel. My sole disappointment in BusyCal 3 is that you can no longer make this right-side panel as narrow as you could before. 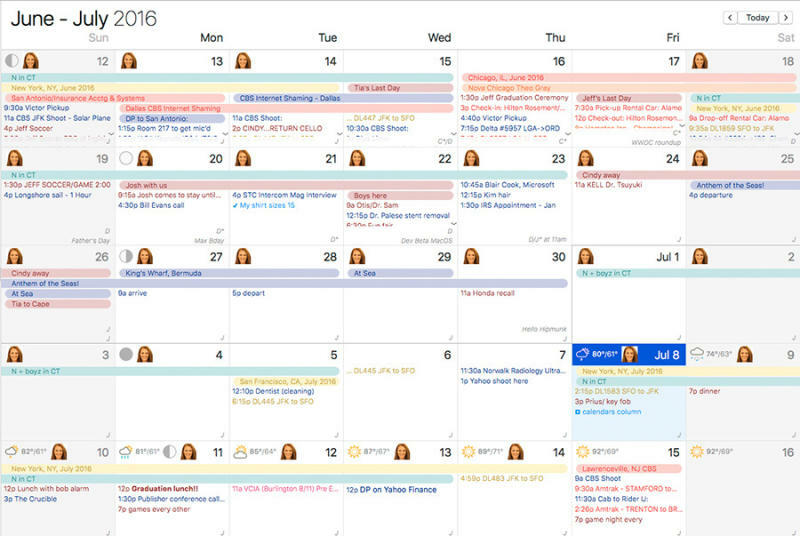 On a 13-inch laptop screen, your Month-view calendar squares therefore show up a little tall and skinny. On the other hand, in BusyCal, these To Do items chase you through life, moving from square to date square, until you finally mark them as Done. That’s awesome. All three programs let you create place-based reminders — reminders that will go off, on your phone, as you arrive or leave a certain place. Here’s something else Apple doesn’t offer: A menu-bar pop-up version of the program. This handy icon (there’s a keystroke for it, too) means that you can always check your calendar or even add appointments to it. 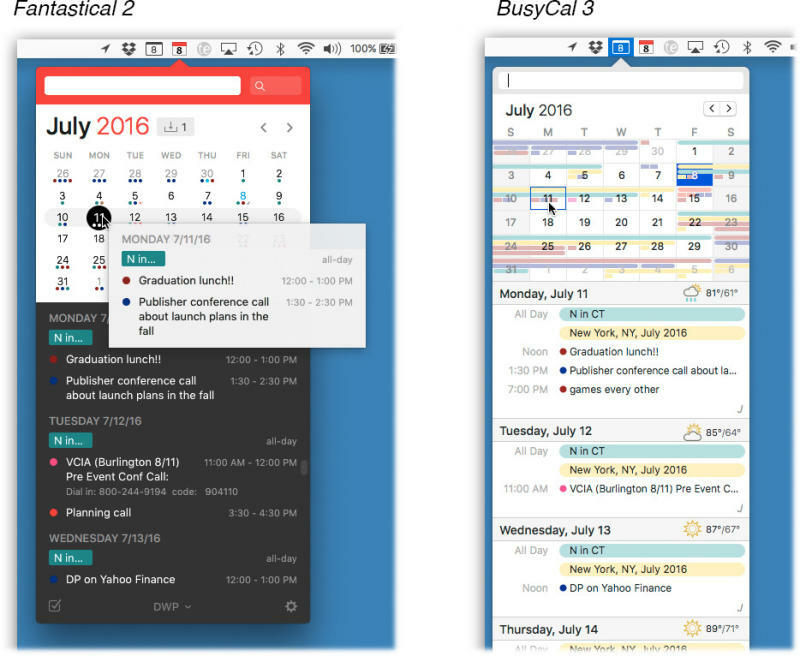 BusyCal’s menu-bar calendar is best, because it works even after you’ve quit the main program. If you quit Fantastical, though, the menu-bar doohickey goes away, too. Both BusyCal 3 and Fantastical 2 also offer iPhone apps that you might find much more attractive than Apple’s free one. They’re an extra purchase (five bucks). Each app behaves differently when you’re holding the phone upright (portrait orientation) and when you turn it 90 degrees (landscape). I’m particularly nutty about the BusyCal app because it so closely resembles the desktop app, complete with all the views. It shows your actual Month-view tiles, not just dots, and expands to show you a date’s full schedule when you tap its square. There’s more. Printing, time-zone display, invitations to other people, color schemes, banners, search, keyboard shortcuts, preferences, and so on. For each feature, BusyCal 3 is almost always more flexible and more powerful than Fantastical, but everything is relative. Both programs blow the basic Apple calendar app off the map in these departments. Both are available in free trial versions, and trying them out references the same data that Apple’s own Calendar app does — so you can easily switch back. If your life is even a little bit complicated — which it probably is if it involves children, a romantic partner, travel, or deadlines — the experiment is well worth conducting. David Pogue is the founder of Yahoo Tech; here’s how to get his columns by email. On the Web, he’s davidpogue.com. On Twitter, he’s @pogue. On email, he’s poguester@yahoo.com. He welcomes non-toxic comments in the Comments below.